This content has been archived and may be out of date.Competition touch starts this week on the 16th of May and the draw for week 1 was published Saturday is available here: https://princesparktouch.com/season-draw/ Note some teams have the bye in week 1, our comp is 16 weeks long so teams will all play 13-14 games which is more than other touch comps in Melbourne. Weeks 1 and 2 are a grading rounds with two half length games for all teams. These round along with your team nomination will be used to determine your teams ultimate grade for regular season play. Please note that given there are plenty of new faces mismatches in grading may occur. But grading enables us to match teams closely over the remainder of the season. For new players a map to the ground is available on the website, and for those coming via car there is parking both of Altona Street and behind the pavilion in Childers street. The Bill Vanina pavilion is ours again this season and is the best club house in Victorian touch. So please make use of the function area, kitchen, toilets, changing facilities, etc. If your team needs 1 or two more players I do have a few floating around, so let me know. Full fees for the season are $1320 ($500 deposit plus $820 residual). For those teams who have not yet paid their deposit ($500) they are now due and Brad and I have sent through a separate email with the bank details. As previously mentioned we need every player registered as member this season. This involves adding their details via the website, and the players clicking on the confirmation link in the email they are set. Until they have clicked on the confirmation email they are not yet a member. 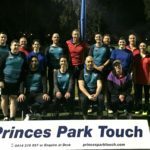 Make sure you and all your team have read and understand the FAQ on the website: https://princesparktouch.com/membership/ It is a condition of entry of our comp but more importantly has vital information for both players and team captains. It will be great to be back.